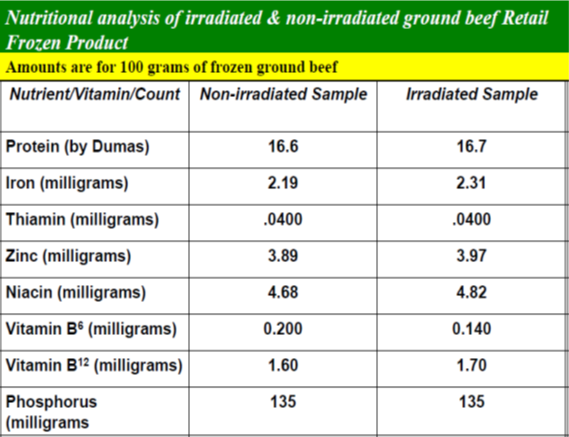 Ionizing radiation will reduce, or even eliminate, pathogenic microorganisms such as Salmonella, E. coli O157:H7, Clostridium perfringens, Staphylococcus aureus;, Listeria monocytogenes, Campylobacter jejuni, and the protozoan parasite Toxoplasma gondii on meat and poultry. Food and Drug Administration has approved irradiation of meat and poultry. Machines called electron accelerators produce energy for X-ray and electron beams. Gamma rays are produced by radioactive substances (Cobalt-60 or Cesium-137. 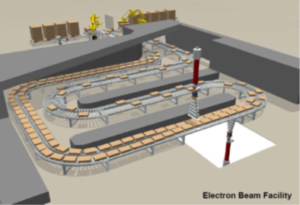 The Food is packed in containers and moved by conveyor belt into a shielded room. Exposure of food to carefully controlled amounts of ionizing radiation for a specific time. 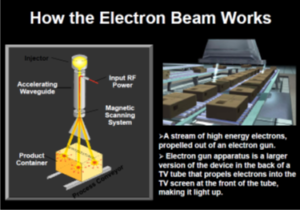 The radiation energy causes changes in molecules by breaking chemical bonds. At small doses, irradiation inhibits food spoilage problems. Medium doses will kill or genetically alter microorganisms so they can’t reproduce High doses will sterilize foods and is required to kill microbes in frozen foods than fresh food. The organism’s sensitivity to irradiation. 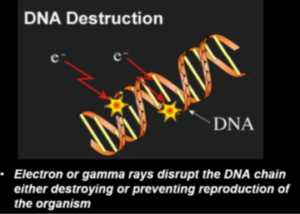 The rate at which it can repair damaged DNA. Amount of DNA in the target organism. Parasites have large amounts of DNA, are rapidly killed by an extremely low dose of irradiation. Viruses are the smallest pathogens that have nucleic acid, and they are, in general, resistant to irradiation at doses approved for foods. 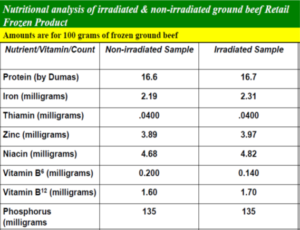 Carcass Irradiation: The American Meat Institute (AMI) has submitted a petition to the USDA’s Food Safety and Inspection Service (FSIS) to recognize the use of low penetration and low dose electron beam irradiation on the surface of chilled beef carcasses as a processing aid. Ready-to-eat Foods: Grocery Manufacturer’s Association (GMA) has petitioned FDA to allow irradiation of certain prepared foods including hot dogs, luncheon meat, etc. Irradiation approved for poultry and meat can reduce numbers of pathogenic and spoilage bacteria but it does not sterilize the products. Poultry and meat products will continue to require proper refrigeration and handling by retailers and consumers. Irradiation complements proper food handling practices, including refrigerated storage. It does not replacement them. The FAO/IAEA/WHO joint committees stated that irradiation of food at doses up to 10 kGy introduced no special nutritional problem. Irradiated foods are wholesome and nutritious. 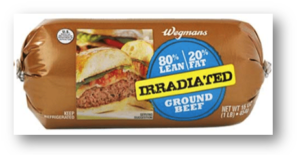 Irradiation produces no heat within food. Losses of proteins, carbohydrates, and fats are still very small at very large doses. No trace minerals are lost. A small percentage of vitamins may be lost (colder the meat during the treatment, the lower the thiamin destruction). Health Regulations require that all treated products be labeled with wording (“treated with radiation” or “treated by irradiation”) and an international symbol called the “Radura logo” at the packing/wholesale and retail levels. Scientists from the U.S. Food and Drug Administration, the U.S. Department of Agriculture, the U.S. Department of Energy, and universities reviewed several hundred studies on the effects of food irradiation before determining its safety. Food irradiation has been approved in 37 countries for more than 40 products. At no time does radioactive material enter the food, and food is not radioactive after treatment.